Can't wait for your recruitment recap! Also, totally jealous you got coffee with McKenna. SO jealous you met McKenna - I love her blog! Also can't wait to hear about all the excitement going on, hope you are enjoying your last recruitment! Sounds like you've had such an exciting week! Jealous that you met McKenna! YESSSS!! Capes are the most perfect winter time coat! I have a few and I love them all! I love turning blogging friends into IRL friends! I just fell in love with a couple of OPI colors from their Venice line. Opera-tunity and Prosecco are two words in the names, but I can't remember the full names. They're perfect, check them out! Love catching up with what is going on in your life! Even with being away from the blog-world I still always kept up with you on Instagram. Hope you had the best birthday! Enjoy 21!! I have the same issue with nail polish! I only get a pedicure every other time that I get a manicure. I'm so glad that you had a good trip to Myrtle! I haven't been since high school. What an exciting week so far!! I feel Jealous that you met McKenna! So excited you're 21!! We need to have a wine night soon! Also, meeting up with McKenna was probably SO fun! Can't wait to hear all about it! You're so lucky you're close enough to Myrtle to just pop in for a weekend! 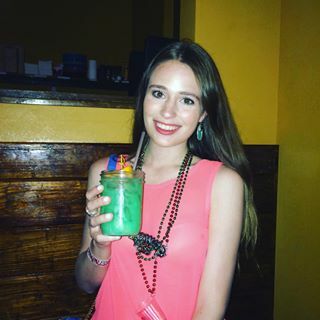 It's such a fun town, but it's a 7 hour drive from me :( I'm glad you had fun on your 21st! I always love meeting blog friends! Sounds like a great couple days... excited to hear how bid stuff goes! I'm so excited to see your cape! And I love the color of that nail polish! You cannot go wrong with a neutral! I LOVE meeting blog friends! It reminds me why this is all worth it! I can never get enough of J.Crew necklaces! They're the epitome of fall layering! Yay for seeing your mom and doing some shopping and having a fab 21st! All great things. And I've gotta check out McKenna now...she sounds wonderful! I'm glad to hear you had a fun birthday in Myrtle Beach, and that's SO fun that your mama's coming to visit!! And I agree- McKenna Bleu is a crazy amazing blog! I love Myrtle Beach so much, but I haven't been for years! I'm glad you had a fun time celebrating your birthday there! All of your snaps and Instas looked so fun! Your purchases were so amazing and it looks like you had a blast on you 21st!! Happy birthday!